tenEcmServer can connect to five ECMs simultaneously. You can connect to all of them via the serial port (using a MUX adaptor from Brultech to connect more than one ECM to the serial port), all of them via ethernet, or several via each method. 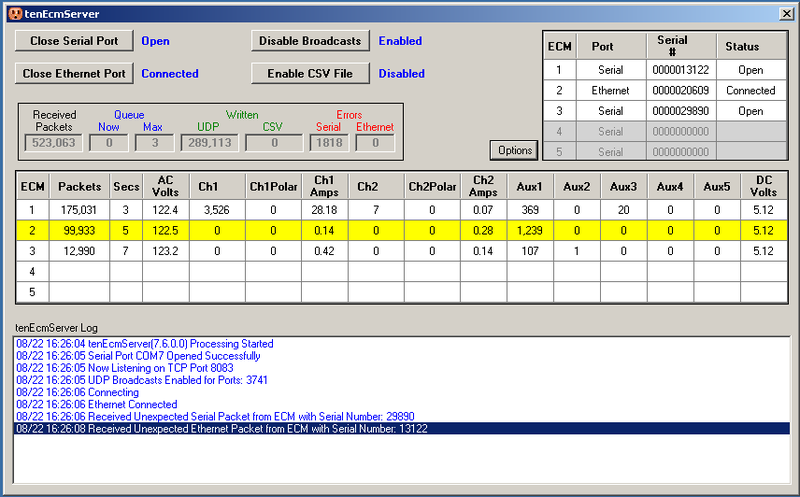 Select Connect to ECM(s) via Serial Port and/or Connect to ECM(s) via Ethernet. If using the serial port, select the COM port that the ECM(s) are attached to. If connecting via Ethernet through the EtherBee or EtherPort, select the TCP port configured for the EtherBee/EtherPort (usually, 8083). You should have already run the EtherBee configuration program that set the TCP port. You also should have configured the EtherBee with the IP address of the tenEcmServer computer. You also specify the ethernet connection timeout in seconds. 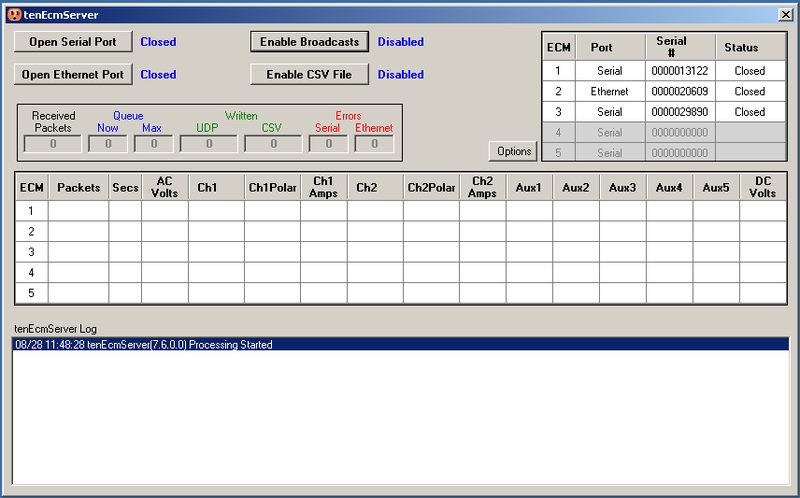 Specify a number that is at least twice the expected interval between ECM transmissions. Now that you have configured the connection methods (serial port and/or ethernet port) you must configure each ECM. Check the boxes to enable each of the five ECMs you have connected to tenEcmServer and specify for each which connection method (serial or ethernet) is used for that ECM. Enter the Serial Number for each ECM. If you do not know the serial number, enter any five digit number and you will get an 'unknown ECM serial number' error message containing the serial number once you open the communication port(s) and packets are received. Then enter the UDP Ports (separated by a comma) to be used to broadcast data to client programs and click the Update button. In most cases, only a single UDP port is necessary. Multiple computers can all receive on this same port simultaneously. In most cases, multiple programs on the same computer can also receive on the same port simultaneously. 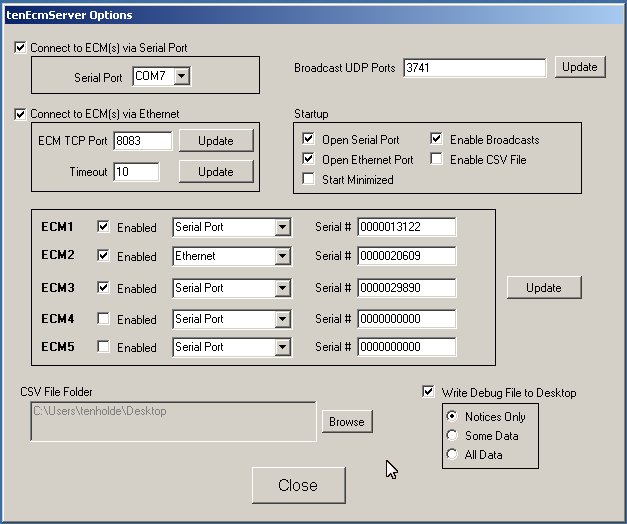 If you find that you are having difficulty running multiple clients on the same computer using the same port, you can have tenEcmServer broadcast on up to 3 ports and have each client program listen on a different port. Although tenEcmServer broadcasts Comma-Separated-Values (CSV) formatted UDP packets and there is a tenEcmCsvLogger program that receives these packets and writes them to a flat file, you can also have tenEcmServer write the CSV records directly to a flat file. You can change the default folder (but not the file name) in which the records are written by browsing to the target folder and clicking OK. The file name is always tenEcmCsvLogger.csv. You should also check the Write Debug File to Desktop box and select at least Notices Only. When you first start tenEcmServer, you must manually enable ECM communications and packet Broadcasts. In the Startup section of the Options dialog, you can specify that you want to automatically open the serial or ethernet ports, start writing CSV records to a file, and minimize tenEcmServer to the notification area as soon as tenEcmServer is started. You can then place a shortcut to tenEcmServer in the windows Start/Programs/Startup folder and automatically run tenEcmServer unattended. You can minimize the window to the Notification Area by clicking the X at the top-right of the window. Right-click the icon in the Notification Area to either restore the window to normal size, display the Options dialog, or to close tenEcmServer.